Anyolite is a metamorphic rock composed of intergrown green zoisite, black/dark green paragasite and ruby. It was first discovered at the Mundarara Mine,Tanzania in 1954. 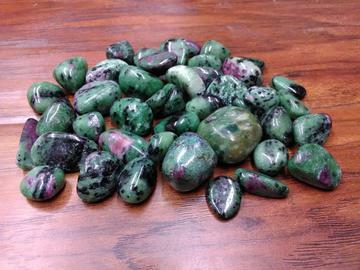 Ruby in Zoisite is an energy amplification stone that energizes the entire field of body. It is used for healing from abuse or trauma issues stemming from incidents or situations in this life or others.